“Why do you think space travel is important?” a NASA bigwig asks Neil Armstrong during the biggest job interview of his life. It’s all about a change in perspective, the future astronaut replies—about finding a new way to see the world, and maybe everything else, too. First Man, Damien Chazelle’s grippingly unconventional portrait of this “reluctant American hero,” offers a fresh outlook of its own. As biopics go, it’s singularly focused on literal nuts-and-bolts work, the years of elbow grease and sacrifice it took to get Armstrong and the rest of the Apollo 11 crew to the moon. Yet the film also views this historic event almost entirely through the eyes (and by extension, psychology) of its real-life icon. 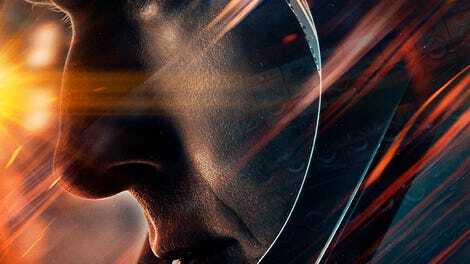 What Chazelle has made, in other words, is a nitty-gritty procedural that treats the NASA odyssey as a window into Armstrong’s unknowable mind, an inner space as mysterious as the outer one he blasts himself into. The film has other theories, too, about what drove the unofficial face of NASA, the civilian who would eventually make human history planting a foot and a flag on very foreign soil. (Yes, we see the flag—just one reason why the manufactured controversy surrounding this admiring portrait of American determination is so asinine.) Written by Josh Singer, who shaped a triumph of investigative journalism into the award-winning Spotlight, First Man recounts a significant decade of Armstrong’s life, from pushing boundaries as a test pilot to taking that one small step for mankind. In another echo of Chazelle’s past work, the script pits the man’s personal life against his professional ambition, alternating glimpses of grueling, life-risking exercises with quieter scenes on the home front, as Neil struggles to be there for his wife, Janet (Claire Foy, very strong as the bedrock of the family—a sometimes thankless role, for character and actor alike), and his two young sons. Singer’s most conventional choice is treating the death of Armstrong’s daughter, who succumbed to pneumonia the same year he applied to NASA, as key motivation—the staggering loss responsible for both his superhuman drive and what the film presents as a kind of emotional constipation. To hear First Man tell it, getting to the moon took skill, knowledge, and more than a little masochistic chutzpah. The astronauts, played here by an ensemble of square jaws and baby faces (including Jason Clarke, Patrick Fugit, Christopher Abbott, Ethan Embry, and Corey Stoll as a hilariously tactless Buzz Aldrin), had to be scientists and athletes, subjecting themselves to spinning, nausea-provoking simulators one day, basic rocket physics the next. Trial and error was a big part of the process: “We need to fail down here so we don’t fail up there,” Armstrong insists, though even some of the mistakes and malfunctions at ground level cause devastating casualties. Chazelle and Singer acknowledge both the impressive resourcefulness and faintly insane overreach of the space race; they were winging it, attempting the impossible with relatively primitive technology—“Boys making models out of balsa wood,” Janet calls them, after Director Of Flight Operations Deke Slayton (Kyle Chandler) cuts the radio feed during a mission gone wrong. After decades of hagiographic retrospectives, the film emphasizes what NASA’s grand gamble cost, in dollars that could have been applied elsewhere and in the lives of the men who died just training for the rigors of space travel. Formally speaking, First Man is a remarkable achievement, matching the technical ingenuity of the space program with practical and state-of-the-art effects work. Chazelle films the inner workings of NASA in a way they’ve never been filmed before: in tight, immersive, suffocatingly intimate handheld. He doesn’t just put us right inside the claustrophobic, treacherously fallible tin cans with the astronauts. He practically locks us into their airtight helmets, aligning our perspective with theirs by narrowing our vantage on the action (we often see the boundless wonder of space only through slits and slender windows) and bombarding us with a symphony of roaring jet engines, groaning metal, heavy breathing—the cocoon of terrifying sound encasing these fragile human specimens. Has a portrait of NASA’s early years ever made space travel, and even preparing for space travel, seem so dangerous? The ill-fated Gemini 8 flight becomes an Apollo 13 in subjective miniature, all panic and quick thinking. And even the Right Stuff walk-to-the-launchpad moment is ominous, filtering out everything but the men’s suppressed fear and laser focus. By reputation, Armstrong could be an intensely private man. That’s what makes Gosling such a brilliant choice to play him. To be honest, the star may be at his least convincing when he’s asked to express big emotions. (His inability to come across as genuinely head-over-heels smitten was one of La La Land’s few crucial flaws.) But there’s arguably no one better at implying a wellspring of feeling someone can’t or won’t convey—the secret, beating heart of an urban samurai getaway driver or an android dreaming of electric sheep. In First Man, Gosling applies his suggestive blankness to a conception of Armstrong as a fundamentally distant, interior man: He’s the American hero you’ll never really know. Truth be told, the film’s big dramatic theory, that Armstrong channeled his bottomless grief into an unbreakable work ethic, is a little pat; we’re caught again in Gravity’s gravitational pull to pop psychology. But Gosling makes the character’s bone-deep repression—what a self-proclaimed jazz expert like La La Land’s Sebastian might call the notes that aren’t being played—affecting all the same. And as in their last collaboration, Chazelle often does the emoting for him, in this case bathing his suburban neighborhood in fairy-tale shades of blue, the light cast by the astronomical body Armstrong pours every ounce of himself into reaching. The climax, of course, is spectacular. How could it not be, with Chazelle expanding from 35- to 65mm to capture the hushed, breathtaking majesty of the lunar surface? In its own way, the ending’s as expressively cathartic as Whiplash’s or La La Land’s, with a great, overwhelming silence filling in for the big-band music those movies used to communicate their characters’ masked, pent-up feelings. There are no cutaways to Houston, no montages of the whole world watching from down below. For a few beautiful minutes, it’s just Neil, alone with his thoughts, faced at last with the experience he hoped might dwarf his profound sense of loss—that brand-new perspective he was describing at the start of the film. Maybe First Man, by its transcendent closing moments, has done the same for us: We see a famous American accomplishment from a whole different angle—and just maybe the way Armstrong saw it, from behind a glass shield that mirrored the whole galaxy back at everyone watching. First Person could have worked as a title, too, come to think of it.